An ethical business doing great things. Not your average travel company. Camps International’s dedication to support the communities they work with means that this becomes one of our goals too. We support them with effective design and marketing, which delivers more volunteers to their camps. Other times our work is more tangible - hand-painted logos on a desert island hut, customised Bedford trucks driving through the African bush, or "mud-spattered" volunteer t-shirts. Our design travels to some of the most remote places on Earth. Camps International was founded by Stuart Rees Jones in 2002 from “a mosquito ridden room typing away on an old and very unreliable laptop.” Since then they’ve come a long way. Today they send thousands of volunteers to 25 permanent community camps across Africa, Asia and Latin America, and their volunteers now take part in over 100 initiatives, which run 365 days a year. We help them to achieve this every day. Our goal is to support Camps International’s varied design and marketing goals for the broad variety of work they undertake. No mean feat, when you consider that these vary across the five continents in which they operate. 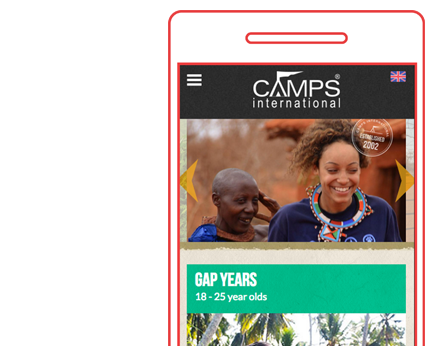 In 2014 we redeveloped the Camps International website into a modern and flexible mobile-first format. The goal was to not only increase sales leads, but also to serve as a hub of information and engagement for customers after booking. Our approach and the results speak for themselves. We developed for Camps a mobile-first Drupal website that serves different content to different regions for smooth and effective internationalisation. It integrates a variety of media, including videos, photo slideshows, downloadable documents such as PDFs and booklets, and social media. The goal was to not only increase sales leads, but also serve as a hub of information and engagement for customers after booking. Camps International have used print brochures, booklets and flyers over the past eight years to support their sales and marketing. We've helped them not only to design and produce these print materials, but also manage their print and marketing budget, with the goal of reducing costs while maintaining high sales. We've also created promotional materials such as posters, adverts, banners and signage. These have helped to not only to boost enquiries, but also generate interest for their charity arm, The Camps Foundation, to help generate more funding and support. We helped Camps International increase their sales leads by 134%. We’ve achieved this by having a broad understanding of their business and applying our skills and experience to improve every aspect of the work we do for them. The website, brochures and marketing strategy we’ve produced all have had a direct result in supporting this increase. We helped Camps International reduce their annual print costs by over £10,000 per year. We’ve achieved this by implementing a stock level monitoring system, allowing us to predict more accurately how long print stocks would last. Using this monitoring system, we were subsequently able to order the correct amounts - which reduced waste and improved value for money. Of course maintaining great relationships with our printers helps too!